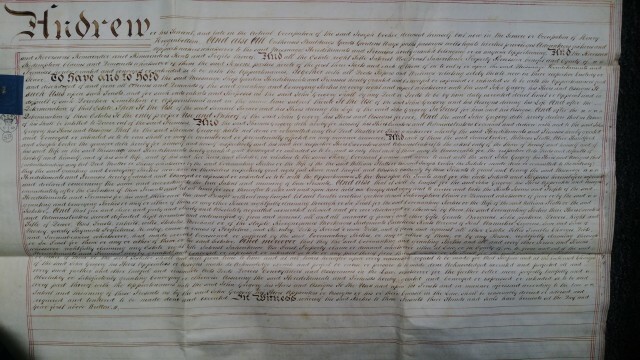 This document was made on the 24th April 1849 between Joseph Cocker the younger of Nithingend Nr Buxton, Corwainer (shoe maker), Thomas Gregory of Eyam, James Cocker of Stoney Middleton, William Platts and wife Hannah (nee Cocker) from Foolow, Alice Handford of Nithingend, John Gregory of Calver and Samual Sarner of Eyam. The family business was boot making, a very important industry in the village with many family dynasties establishing themselves. The Cockers were one such family, synonymous with boot making in the village. The images in this section were all taken from the same document. 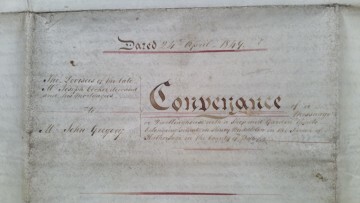 The full document is very large (80cm x 80cm) it is hand written on parchment and consists of two pages bound at the bottom. The complexity of the document suggests that he was a man of substantial wealth and appears to be a will of some description. Hi, Colin, one correction–it’s Samuel TURNER, not Sarner. Joseph Cocker Jr (1804-1858) was the eighth child of Joseph Cocker senior of Stoney Middleton (1766-1840) and of Dorothy Timperley of Stoney (1767-1848). His siblings included Rebecca Cocker (married Matthew Andrew of Eyam); Joanna “Hannah” Cocker (married William Platts of Eyam(her first cousin)); Dorothy Cocker (married Richard Rowse); James Cocker (married Hannah Hallam of Calver; then Sarah Dakin of Buxton; then Jane Boult nee Wood of Stafford, Staffordshire); Eliza Cocker (married William Wadsworth); Alice Cocker (married Joseph Boden, then Samuel Handford/Hannaford); Ezra Cocker and William Cocker (both died young); and Elizabeth Cocker (married William Barnard). 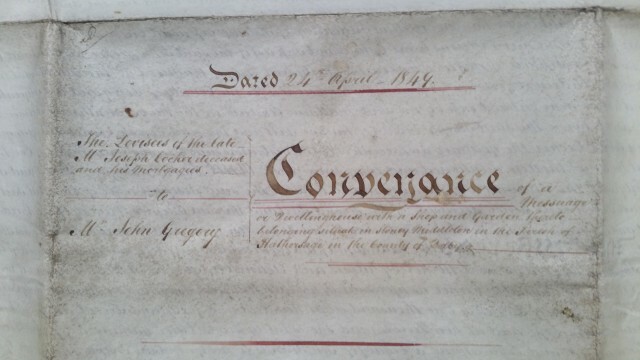 Joseph Cocker junior married Hannah Acton at Manchester Cathedral on 8 or 15 Feb., 1827. They apparently had no children. Joseph’s brother James, by his 3rd wife Jane (Wood) Boult, had a youngest son, Ezra Cocker (1839-1909, married Ellen Goddard of Stoney). Ezra was one of the major Victorian-era shoe manufacturing proprietors at Stoney Middleton. 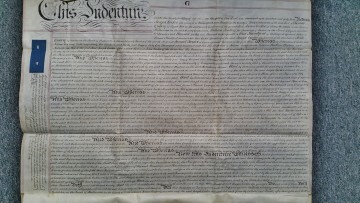 Though his mother, nee Dorothy Timperley, Joseph Cocker junior was a blood relative of a number of Stoney-area Wesleyan ministers, and his maternal relatives included Mayor Joseph Hallam of Sheffield and Joseph Hallam’s brother Samuel Hallam, co-proprietors (with two Worralls from Froggatt) of Hallam Worrall Needle Manufacturers of Sheffield and Dundee, Scotland, to whom my great-great-grandfather, John Hallam, as noted in the other indenture you’ve published on the website, was apprenticed in 1851. Joseph Cocker junior’s paternal grandfather was Jonathan Cocker of Stoney (1738-1809); I descend from Jonathan’s elder sister, Hannah (Cocker) Sellers (1723-1800). 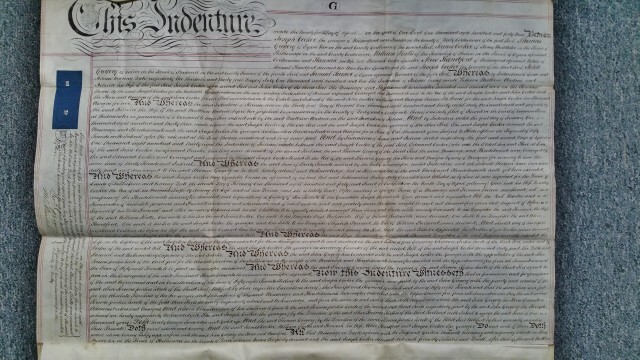 This is a very interesting branch of the family, and I’ve never seen this Joseph Cocker indenture; thank you for publishing it! Best, Glenn T.
I am the great granddaughter of Ezra Cocker, the granddaughter of his son Frederic and daughter of his son Joseph. I would love to know more about this line of the family. Hi there my Grandma was Gertrude Siddall (nee Cocker) from Stoney Middleton.. she married my Grandad Samuel Siddall from Dore and they both lived in Peakdale, Buxton. I understand my Grandmas family from Stoney Middleton were Cobblers/ bookmakers. Is there a link here? ?